Italian tragedies are the best. Even better when they turn out NOT to be Italian! DNA tests can sometimes bring families together, but they can also put some in misery. On-sale DNA tests for consumers became a thing in the early 2000s and have continued to ruin lives thereafter. 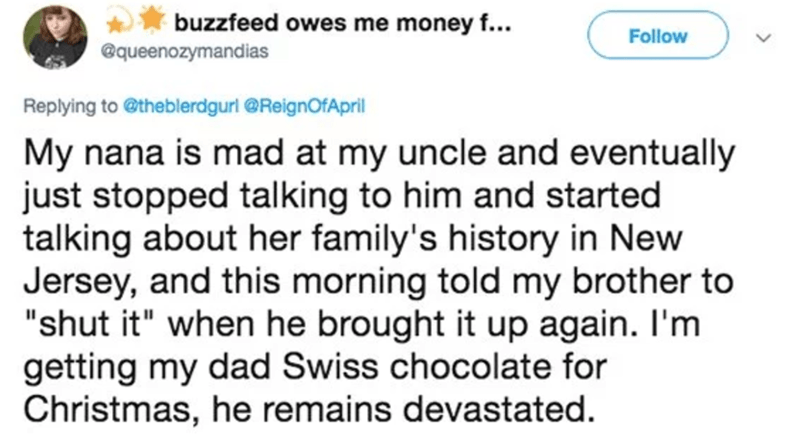 Just imagine if you believed in something about your family ancestry all your life and suddenly it all becomes a huge lie, your whole heritage changes in just a matter of moments Well, something similar happened here which sent a family into a state of panic and somewhat depression. Recently, when Christine (@queenozymandias) went back home to spend a weekend with her family, something quite unexpected took place. Yes, that’s right. A DNA test ruined the weekend for her and her family, or you can say, ruined the life of his father. And this was done by none other than her own uncle! He had a DNA test and what resulted is just a scroll away. So this is how it started, and to keep it all the more interesting, Christine kept tweeting all about it moment-by-moment. It’s actually kind of both funny and tragic at the same time which makes me feel sorry. And what else can be done finally? Try to look for possibilities with which you can still keep yourself content. I cannot imagine the tense situation at their house right now. Umm, so basically she’s to blame? And obviously, people kept saying the thread wasn’t long enough and asking about what happened next. I actually genuinely feel bad for this family and the mental crisis they’re in. She must be hiding her satisfaction and excitement at that moment but not for long! So what are your views on this DNA testing matter? Do share them with us in the comments below.